An impressive dessert, delicious with mascarpone or your favourite ice-cream! Using a rolling pin, roll out the pastry on a lightly floured surface. Prepare an 8 inch tart tin by lightly greasing and place the pastry on top. Press the pastry into the edges and trim. Prepare the pears by peeling and slicing each pear in half, remove the seeds. In a large saucepan, add one and a half pints of water, the caster sugar and lemon wedges. Bring the mixture to the boil then reduce the heat to a simmer and add the pears. Cook for 10-12 minutes until the pears have softened, remove the pears from the syrup and allow to cool. To make the almond mix place the butter, sugar, ground almonds, corn flour and eggs into a bowl and whisk until the mixture is smooth in consistency. Pour the mixture over the pastry, and place the halved pears on top. Sprinkle with the flaked almonds. Place in a preheated oven at 180°C/350°F/Gas Mark 4 for 30-40 minutes until golden brown on top. To make the glaze mix 1 tablespoon of apricot jam with 2 tablespoons of water and heat over a moderate heat until the jam has dissolved. Remove the tart from the oven and glaze immediately. This is delicious - simple to make an really moist and tasty - also impressive looking for such little effort! 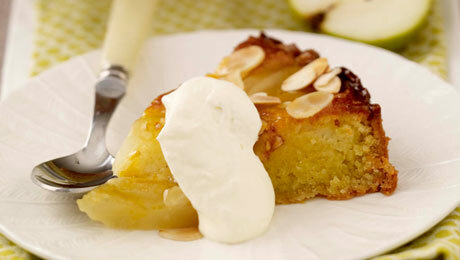 Make it even simpler and quicker by using tinned pears.